But July 4, 1776 wasn't the day that the Continental Congress decided to declare independence (they did that on July 2, 1776). And it wasn't the day Thomas Jefferson wrote the first draft of the Declaration of Independence (that was in June 1776). Or the date on which the Declaration was delivered to Great Britain (that didn't happen until November 1776). Or the date it was signed (that was August 2, 1776). 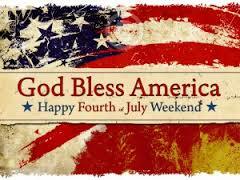 cj sez: The Lyrical Pens wish you a safe and wonderful Independence Day holiday. John Hancock, the first signatory, was the only person to sign on July 4. The Lee Resolution, also known as the resolution of independence, was first proposed by Richard Henry Lee of Virginia on June 7, 1776. It is the earliest form and draft of the Declaration of Independence.